We all know the old adage: what happens in Vegas stays in Vegas. But it doesn’t always work out that way. Sometimes you party so hard that you need some help. Maybe you tried your luck against that smug blackjack dealer one too many times — blowing your savings in the process — or maybe you honestly thought the lovely “lady” at the bar with the Adam’s apple you kept buying drinks for was indeed…well you get the picture. It’s during those lowest lows – when you’re lying in a combination of alcohol, shame, and regret — that you think to yourself, “boy, wouldn’t it be nice if there was a something or someone to help through me all this?” Luckily, now there is. 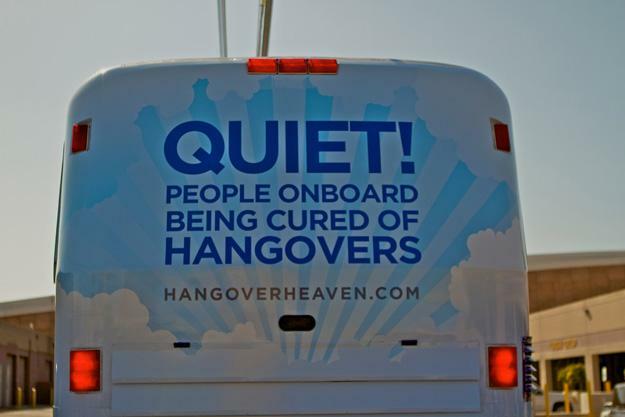 Pulling your inebriated behind from the depths of hangover hell is the aptly named Hangover Heaven bus. 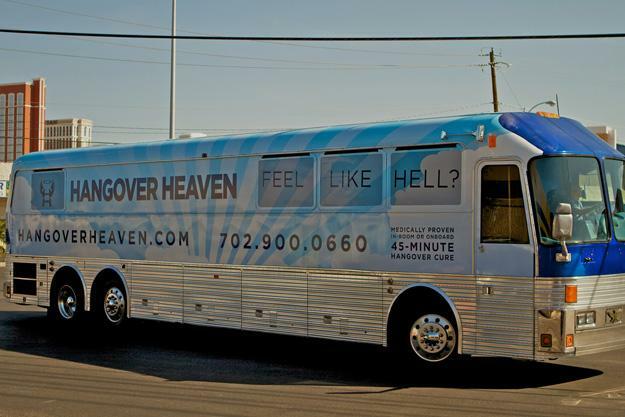 Okay, so what exactly does the Hangover Heaven bus do? Well, after a long night of partying hard on the Vegas strip, Hangover Heaven will pick you up from a number of major casinos like the Hard Rock Hotel, Paris, Bellagio, or Cosmopolitan. Better yet, if the drink has taken you beyond your ability to walk, Hangover Heaven will send a helpful attendant up to your room, equipped with IV in hand, and have you back on your feet and ready to party in a mere 45 minutes.